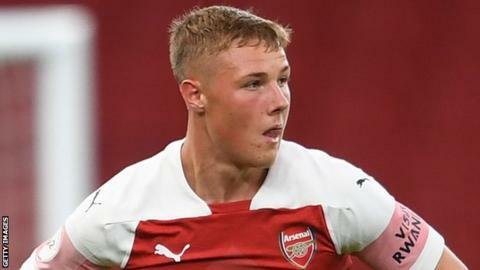 A last-gasp Daniel Ballard goal earned Northern Ireland Under-21s a 1-0 win over Iceland and kept their slim hopes of qualification for next year's European Championship finals alive. Ballard scored in the 90th minute of Thursday's qualifier in Reykjavik, with Jamie McDonagh providing the assist. NI must also beat Slovakia in their final qualifier in Belfast on Tuesday to have a chance of qualifying. Four of the nine group runners-up will progress to the play-offs. Spain have won Group Two, but Thursday's win for Ian Baraclough's side moved them into second place, two points above Slovakia, who have a match in hand. The 12-team finals tournament will be staged in June 2019, with Spain, France and hosts Italy assured of their places. Last month Northern Ireland boosted their prospects with a superb 2-1 win in Alicante, which ended Spain's 100% record in the qualifying campaign - although the home side were already through to the finals. Ballard's winner came at the end of some sustained pressure from the visitors in the closing stages, but they first had to weather several Iceland attacks in the first half. Northern Ireland keeper Conor Hazard superbly blocked a Arnor Sigurdsson shot with Julius Magnusson, Alfons Sampsted, Ottar Karlsson, and Samuel Friajonsson all missing chances. Derry City's Jamie McDonagh then fired wide Northern Ireland's only real first-half chance but Ballard had to be on hand to clear a Karlsson effort off the line just before the interval. In the second half, Northern Ireland duo Liam Donnelly and Shayne Lavery both had sights of goal but fired wide, while there were appeals for a penalty when Jordan Thompson hit the deck but the referee was not interested. Northern Ireland continue to build pressure in the closing stages with Pierce Bird denied, but just when it looked like ending in a draw, Ballard got his head on McDonagh's corner to earn three vital points.